This week the men are in control at the Rose Ceremony, so the women hope to keep up their connections. Except new girls are here! Sarah from, you guessed it, Nick's season walks down in her floral romper and hugs the Nick reject squad. The girls want Sarah to date Ben, but he won't STFU about his dog. Sarah invites Adam on her date after Raven says she's cool with it, but really Raven is far from OK. Sarah and Adam go on the usual Paradise date of drinking margaritas and dancing. It's a great time which makes Adam more torn about who will receive his rose. Lacey gets a date card but wants a romantic date, not a trip to the friend zone. After asking basically everyone, she settles on Diggy, the guy who like one day ago kissed her so maybe she should've followed that thought sooner. This date is presented by Jorge's Tourges, the travel venture of the show's former bartender. 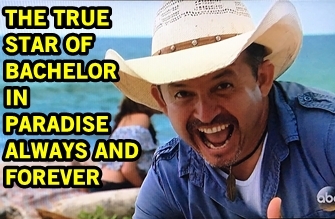 Teased on the date card as a visit to the "most romantic place," the trio go on a horseback riding adventure ending at the very beach where Jorge was conceived. Add this to my bucket list travel destinations. It's a successful romantic date that all comes crashing down quickly when Dominique from, let's say it together say it all together, Nick's season arrives. Her sights were set on Diggy and her friend Taylor confirms they'd be a good match. Diggy heads off for his second date of the day, which might just be a different area of the hotel they're staying at, admitting to Dom that he didn't really connect with Lacey. Diggy and Dominique definitely connect, making their way for romantic hot tub time. Lacey is not pleased and in tears, partially blaming Taylor for playing matchmaker. Love is fleeting in Paradise. Danielle M isn't really feeling anyone in Paradise except for Wells the Bartender, but he's here to sling the drinks not chug them and aimlessly hook up. Turns out, they went on a date four years ago but chose to remain friends. Given that her love prospects are a flop and she got an amazing opportunity to do charity work in Africa, Danielle M chooses to leave Paradise. Everyone is disappointed to see Danielle M leave, especially someone who came to Mexico to find love. Before she leaves, Danielle heads over to the bar to say goodbye to Wells. Wells takes a break and walks Danielle out, and gives her a big ol' kiss. It's like a movie! Or a reality show. Could love have been lingering in Paradise for Danielle all along? We'll have to wait and see in a non-reality show setting, I suppose. The last hour of the episode is a Demario/Corinne special, allowing some of the cast and both sides to speak about what went down that day that ended up shutting down production. And because this show truly is tone deaf, in the middle of this very special episode to address a serious subject, they bring newlyweds Evan and Carly out to have a sonogram on stage. I can't even.